I’m not that great with introductions. I was told by Brian (the other half) that I need to write an About page. To do all of the introductions and to also tell people why we are doing this? (remember this blog is about cycling, more to the point cycle touring) I’m not sure what there is to tell. The last year or so has been a build up to the final moments when we actually board a plane and then start pedaling. Life has pretty much revolved around this point. Collecting gear, making money at our jobs, and setting up everything from renters for the house to insurance for us while we are gone. (Sometimes I hate being an adult) Pretty much making the whole plan come together. Who are we and why have we decided to quit our jobs, run away, and leave our comfy lives for a year or more just to be out on the road? Brian and I met in 2004. With in a month of meeting each other, I bought a Isuzu Trooper and we drove it from North Carolina to Guatemala. We lived down there for about 4 months before returning to the US. Traveling around the country bouncing from Texas to Florida to Tennessee to Alaska to North Dakota before we finally settled down in Minneapolis MN. Minnesota has really become a home for the 2 of us vagabonds. It and our friends will be a hard thing to give up for the next 12 months or so. It has become a rather confortable life for us, good jobs, nice home, (with a mortgage) even 2 cats. Together Brian and I have accomplished everything we set before ourselves. And for the last few years we have lived the so called American dream. We even do some traveling in the winter time, nothing extensive but we both are able to get away from our jobs when the weather turns cold. We would manage to travel for a few weeks and even a few months at a time. So why give that all up? Well to tell you the truth we aren’t really. Our lives will be here (in Mpls) when we get back. There is a friend to care for the house, cats, and cover the mortgage payment. Work is pretty flexible in the trades,he is a Flooring Installer and I a Crane Operator. No real issues there. Things were just starting to be a little to confortable, if you get my meaning? Settling down has it’s advantages but it also has the crushing boredom of being in one place for to long. I think that we have finally gone stir crazy. Brian’s reasons (from what I can speculate) are that his inner Hobo is getting itchy feet and need to be moving along. Experiencing the road again but on a different level. Having a new adventure, setting new goals, and challenging himself. I totally understand that! Breaking free for awhile and just having fun. Is there really an other reason needed? I love my life and what we have created here in MN but in order to keep your sanity sometimes you need to change things up a bit. My reasons are of a more personal nature. 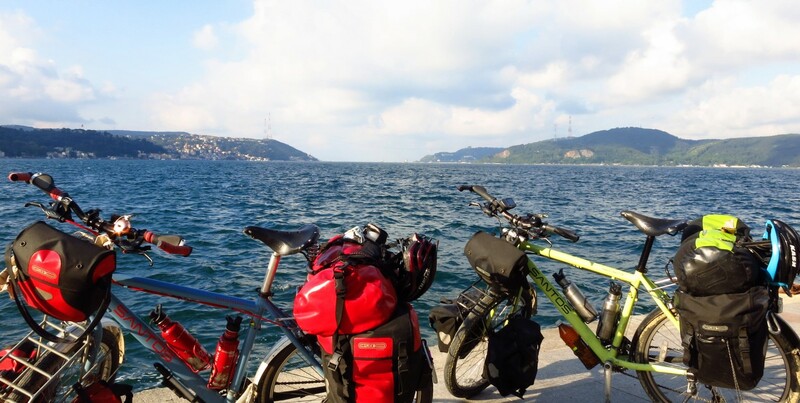 I fell in love with the idea bicycle touring as a way to travel. The reality turned out to be just what I was waiting for. It was just a romantic, exotic, and exciting as I could have ever imagined. I was told by someone after our first tour that if India didn’t make me hate bicycle touring then nothing will. This current 12,000 mile excursion had been on the back burner for the last few years, only recently we decided to jump all in a really do this thing. I say recently but it was January 2012 when my mind was made up. That was the month when I got a pre cervical cancer diagnosis from my doctor. Not full on cancer, cervical cancer is a slow creeper in most cases. So I’m lucky so far, but it’s not all gone yet. I’ve been through 4 procedures and 2 minor surgeries and have one more check up about a month before we have plane tickets to leave and start our tour in Morocco. So my reason is pretty clear I think. You can’t wait to do the things you always wanted to do. You might not live to see that day. Stop being lazy or scared and just move. I guess I’m grateful in a way, I got a wake up call before I got to sick or old to hear it.